P Shaped conservatories are perfect for those homeowners with a little more building space. Fully adaptable and able to create an expanse of extra living space adding value and desirability to your home. The P Shape is effectively a combination of two conservatories allowing for a much more flexible fit. 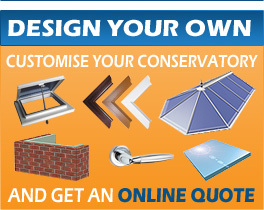 So go on, why not get a quote today and be pleasantly surprised at how much you can save when you DIY! If you would like to know more, simply give us a call on 0800 612 6234 or contact us, we will be happy to assist you or answer your questions. Copyright © 2011 by Self Build Conservatories .com. All rights reserved.